In the madness and violence of a great battle and its aftermath, Bushrod Carter tries to act his part as well as he can. He must confront his soul and learn from his comrades and from a young girl struggling with her own harsh past. This timeless portrait of a young man's suffering in war has already won praise for its originality and power. 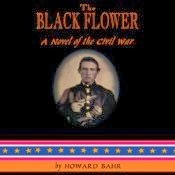 The Black Flower is a story not only of war, but of men and women seeking redemption, who are stripped of all that anchors them, and who at last turn to honor and courage and love. Fiction or Non-Fiction? Genre? : Historical Fiction set during the American Civil War. What Lead you to Pick Up This Book? : This book was a selection for the Literature & War Read-along hosted by Caroline at Beauty is a Sleeping Cat. Apparently American Civil War books are not popular in Canada. This book was out-of-print and my library didn't have it. I, very randomly, could only find it as an audiobook on Audible. Summarize the Plot: This novel takes place during the American Civil War. The novel primarily centres around 26-year-old Bushrod Carter and his friends, but the book also jumps around to other characters. There is even a section told from the point-of-view of a wasp. The book gives you a glimpse in the strain that is put on these young men who are veterans at such a young age. There is one part of the book where a doctor says they push so hard, hardly sleep, and get little nourishment, so anything that happens to them they are unlikely to recover from because of the strain all ready put on them. Bahr even manages to put a girl in the midst of everything without making it a romance. What Did You Like Most About the Book? : Honestly, there were moments where I didn't want to stop the audiobook. When there was action, it was high action. And I was really impressed about his decision to write from the view-point of a wasp and me actually like that scene. I don't really know a lot about the American Civil War, this may be the first book I have ever read about it, but I felt it was a good look at the people. All wars are hard on the people. How many people just think American Civil War or WWI and don't think a 26 year-old man went through hell. He was not perfect. He did things that in other contexts would be horrible, but we see the world from his eyes and understand that he has been through a lot. I am not sure I am articulating what I am trying to say very well! Basically, this book is about the people who make up the war instead of the huge entity that was the war itself. What Did You Like Least? : There were sections that kind of dragged. I found that when things were good, they were very good, but when things started to wan they got a bit dull. I also didn't enjoy the jumping around at first. There were too many people and I was having a hard time keeping everything straight. I don't think I really got in the groove of that until later in the book and then I started to appreciate this writing style. What Did You Think of the Writing Style? : I think I basically answered this all ready by saying that when it was good; it was really good, and when it was bad; it was really dull. It all works in the frame of the story, though. There has to be down moments and I think it makes you appreciate the story even more because of the unevenness. What Did You Think of the Main Character? : I wasn't sure what to make of Bushrod. For starters, what a very unfortunate name. Initially I wondered if it was in fact his last name, but, nope, his first. Even though Bushrod is there from the beginning, I think it was almost halfway through the book, or maybe even more, before I really felt like he was the main character and I knew anything about him. And, I felt really bad for him. Near the end of the book he had just been through so much and was having a hard time keeping it together. This is where those 'little' moments and page-turning moments came together to show who this man really was and what he has gone through. What Did You Think of the Ending? : I think the ending worked. I think the last half of the book was my favourite part of the overall story, anyway. That doesn't mean I necessarily liked the ending, but if I elaborate on why I will spoil it for others and that's not fair. Frankly, if I wasn't participating in this read-along I don't think I ever would have had a reason to read this book. I had never even heard of it before! I am glad I gave it a chance, though. It was a good look at a war I knew very little about. Recommended! Thoughts on the audio: This book was narrated by Brian Emerson. He did a pretty good job. I didn't really pay any attention to who was narrating it when I grabbed a copy of the book, but I was happy with the listen. He told the story well and wasn't boring. If I got distracted from it it was because the story slowed down and not anything against the narrator.